Long time fan of HopDevil (just had it at The Community Tap last week), just learned of a variation on that popular theme, called Wild Devil. Added some brett in an extra week of brewing. "The Victory team of brewers crossed the traditional spiciness of American hops with the tart fermentation aspects of brettanomyces, often referred to as “wild yeast”. With one simple change, everything takes a turn for a unique and deliciously wild brew. The result is floral, aromatic hops paired with kicked up notes of citrus and pine to create a flavor profile not unlike a tart cherry pie." I'll certainly give it a try... it's now up to our locals to latch on to a keg. Anyway, happy to have one of their hoppiest concoctions on hand, Hopstoopid, to help celebrate. So, you were sitting there, sipping an appropriately chilled brew, wondering about the origin of the bottle opener. Well, weren't you? History of the bottle opener not big on your entertainment scale? Big mistake. Writer Ken Weaver (of RateBeer fame) has written what might be the definitive history of the opener's invention and inventor. Afterwards you'll be opening bottles with a whole new reverence. 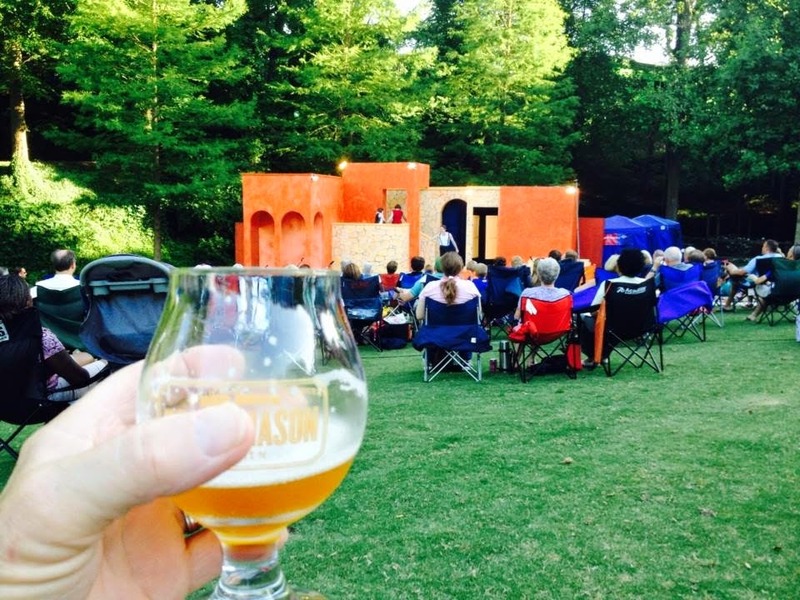 We all know how important food trucks are to our local breweries and, as it turns out, to blues lovers too. Local favorite ASADA was part of the Grand Opening celebration today at Mac Arnold & Plate Full O' Blues' club. And the unveiling of Dr. Arnold's portrait, done by Roberto Cortez of Asada, was a special moment since Mac had not yet seen it. We all saw it for the first time. 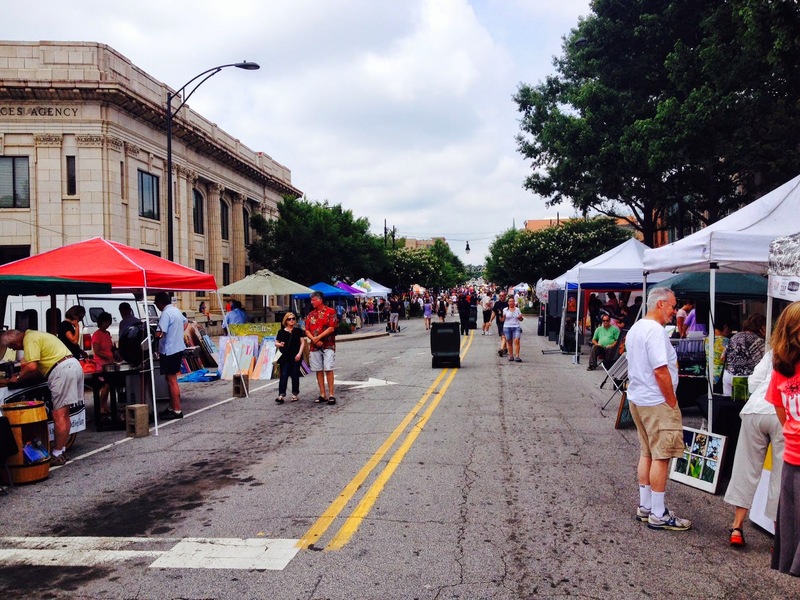 Stop by the club on Pendleton to see it for yourself. Have a Quest Brewing Company Ellida IPA, chomp on some ASADA Nachos... keeping it local. Mashing, lautering, sparging, vorlaufing..... vorlaufing?? 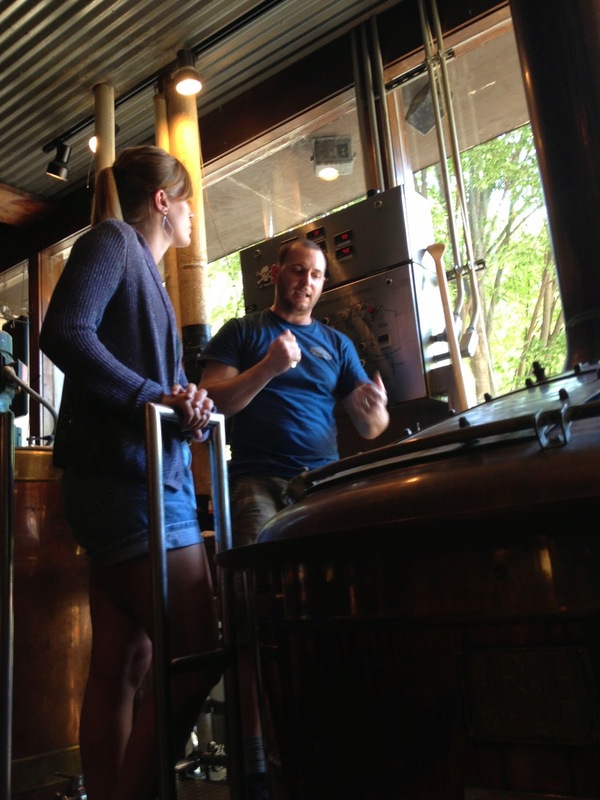 These are some of the activities that took place the other day on my visit to Blue Ridge Brewery to witness the complete brewing process of their latest batch of Boltcutter IPA. Leading the action was Brewmast Dana Dickinson, aided by former intern and now newly hired assistant, Kat Kilpatrick (see my post in January to see her at work). In my role as an interested observer, my primary job was to stay out of the way. recipe). 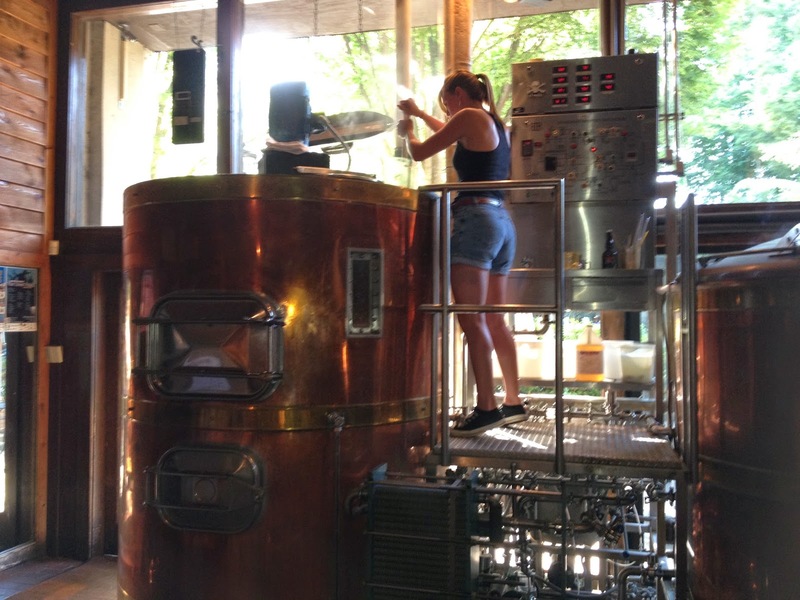 Dana's 10 bbl system is unique in that it still requires a lot of hands-on, physical involvement rather than high mechanization. In this case, an oar becomes a valuable brewing asset to break up the grain pack upon the initial introduction of water. Whatever gets the job done! 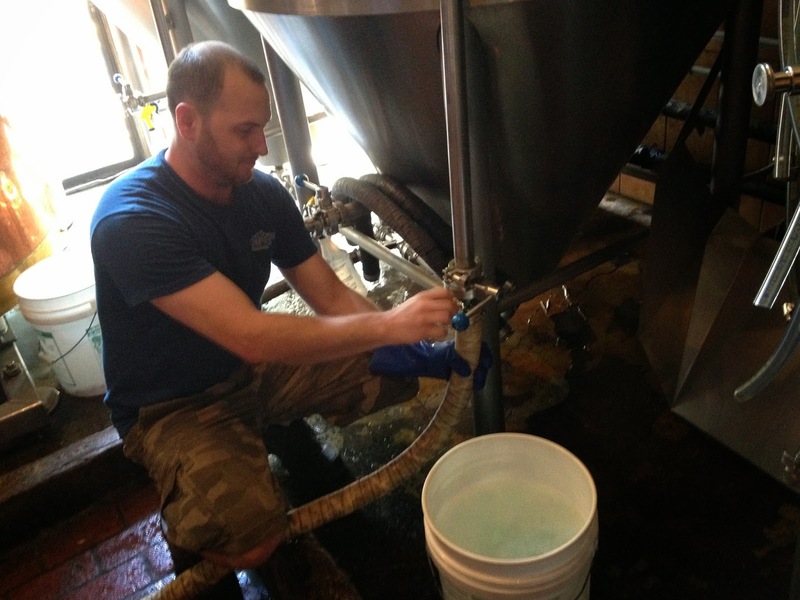 As the liquid, now called wort, drains from the mash tun the lautering step begins... except here at Blue Ridge. Dana adds a preliminary step called vourloffing which means recirculating a portion of the wort back through the grain pack, helping to clear the wort. Dana uses a site glass to monitor the clarity. After about 20 mins, he was ready to begin the sparging. Love all these technical terms. They come in handy when trying to impress relatives or anyone one else who might be buying the next round. Bottom of lauter tun showing the wort circulating during the vourlof procedure. Not all or even many breweries do this. Dana's small system and set up allow this. 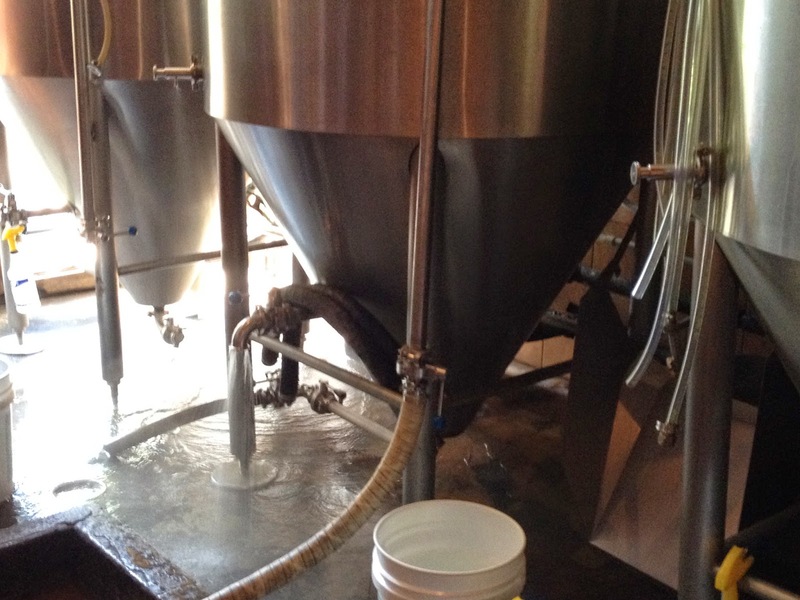 Sparging is the process in which hot liquor (calling it hot water is a no-no!) 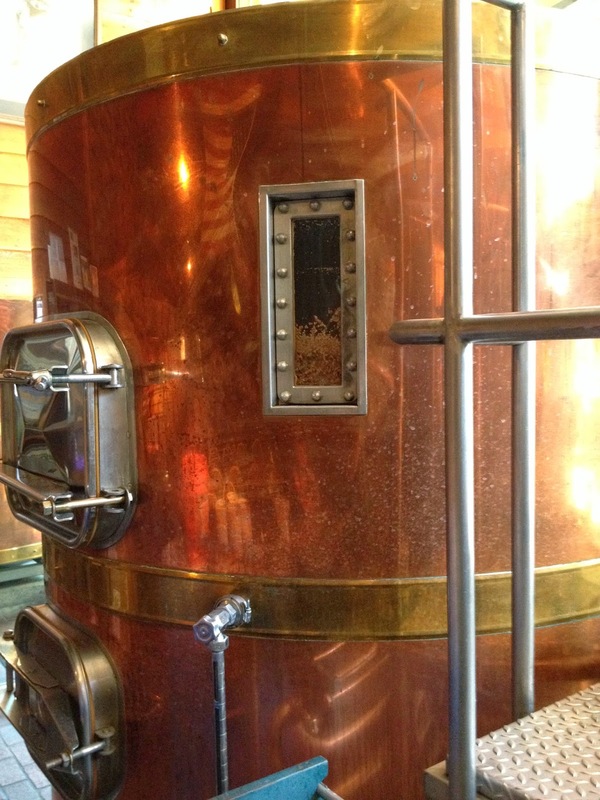 is poured into the mash tun so get the enzyme process going which converts the starches in the grains into sugars which then can be converted to alcohol by the yeasts that will be added later. Pay attention, there may be a quiz! 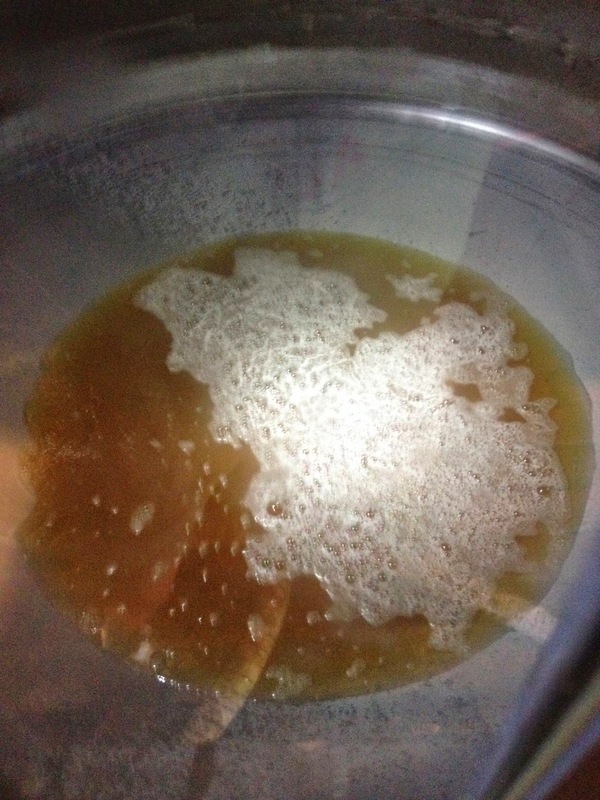 When the proper amount of liquid has been added, then it's drained from the grain pack into the lauter tun where it is continually heated, eventually to boiling. 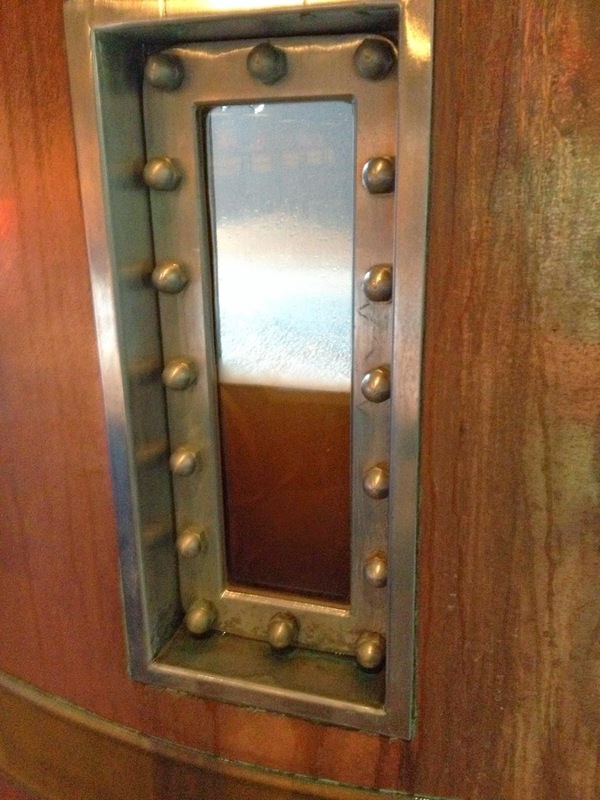 Lauter tun window showing the rising level of the wort, nearing boiling temp. Looking closely you might see a small ink-drawn arrow on the stainless steel edge which indicates that the approximately 310 gallons volume level has been reached. I learned that a 10 bbl system allows for 310 gallons of beer to be made each time. Doesn't sound like a lot until you calculate the number of pints that number represents (2,480)! Lot of happy hoppy hours in there. 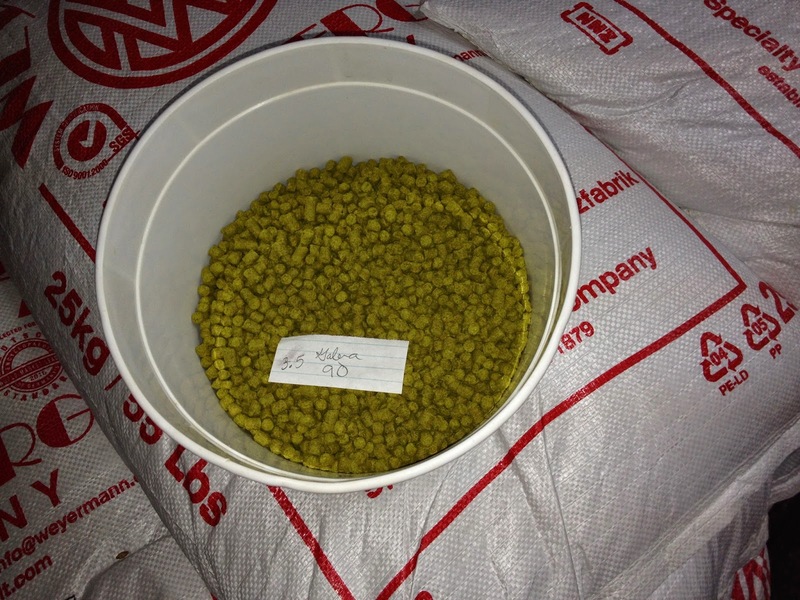 For this IPA, Dana uses Galena hops, cause he likes the bright, crisp quality it brings to the beer. Adding the hops for this recipe is done in four timed stages after the boil begins. Galena hops, ready for their call to action!! They are resting upon the bags of barley from which the grain pack was made. Once the boil was underway and the first addition of hops completed, I was ready for a break but, no, there is always something else to do and in this case, it meant cleaning the mash tun. 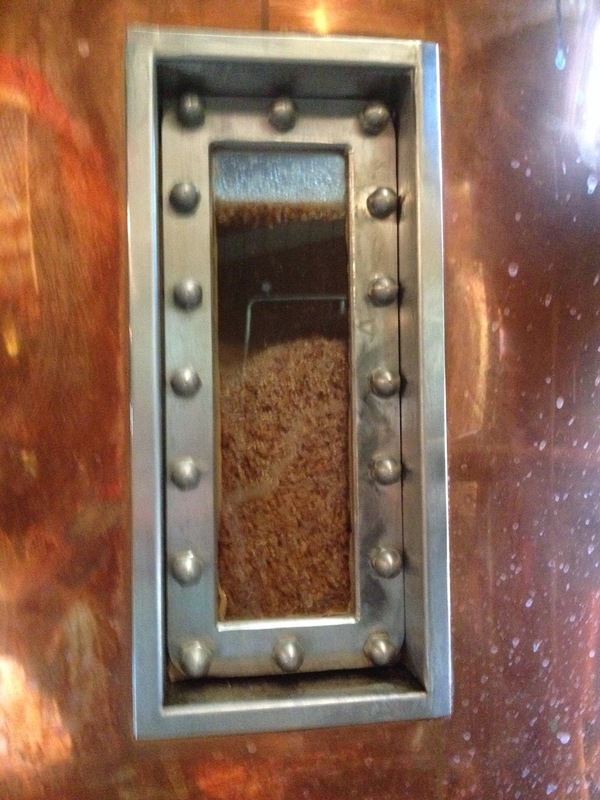 The spent grain has to be removed and the interior thoroughly cleaned. Turns out that the spent grain is not wasted, instead it's dumped into the blue barrels which are then picked up by a local goat rancher to feed his stock. No alcohol at this point but the goats are happy anyway. 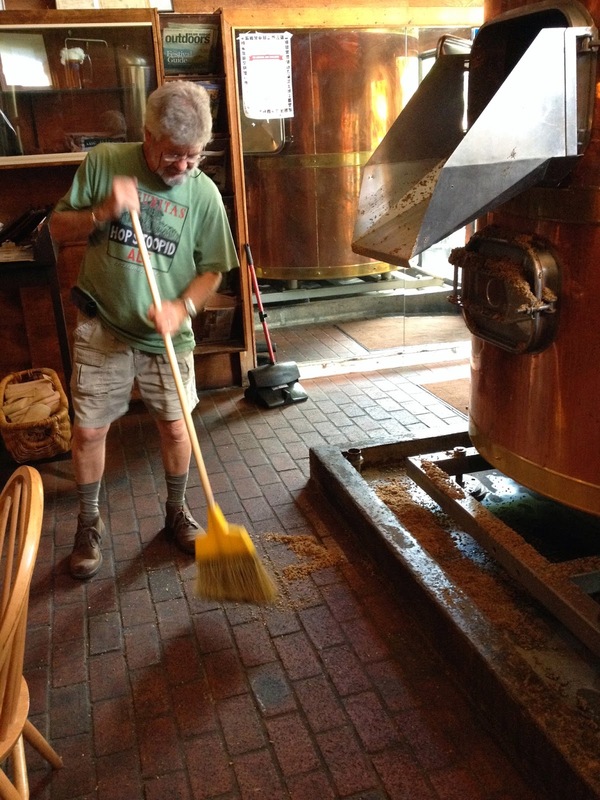 Cleanliness and sanitation are essential components of any successful brewing operation and Dana made it quite clear that he takes the job seriously. He had to prep the fermentation tank before the transfer of the IPA wort could take place, so while it's boiling (over an hour, so he had some time) he takes extra effort to insure the tank is as clean and sanitary as can be. There are several steps in the cleaning process before the tank is deemed ready for filling. 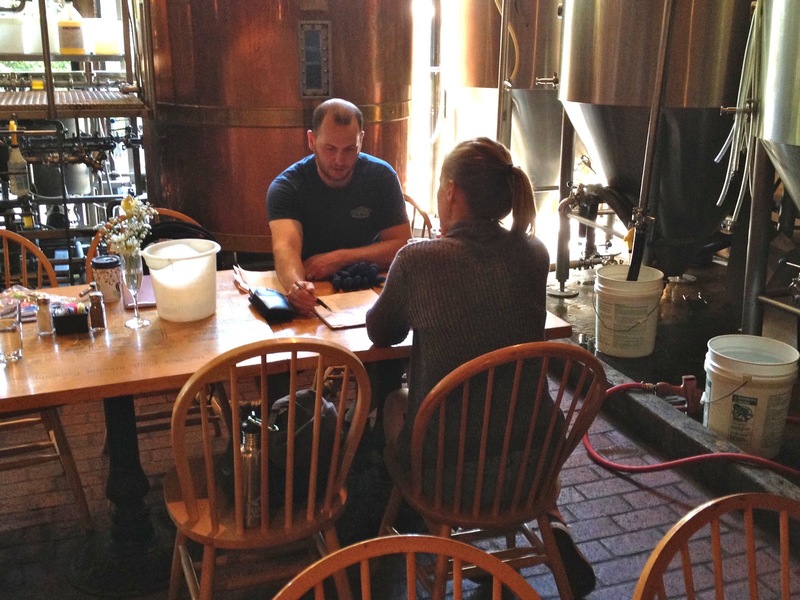 If you've ever been in a brewery, you've certainly seen everyone wearing rubber boots of some type. Necessary cause there always seems to be water being drained or sprayed along the floor during these cleaning operations. With the boil underway and the cleaning done for the time being, it's now time to for Dana and Kat to sit down, recap what they've done so far and discuss the next stages. 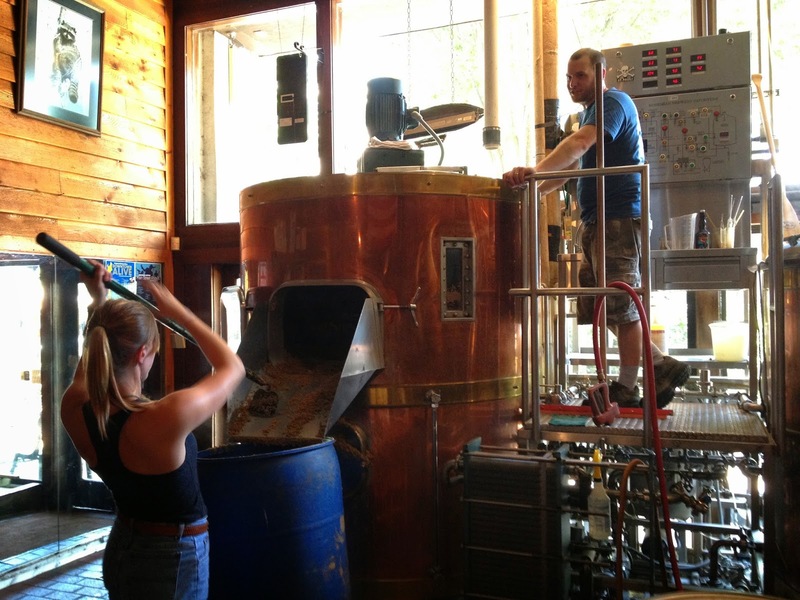 Very important part of Kat's education since by Summer's end she will be participating in all phases of the brewing process. 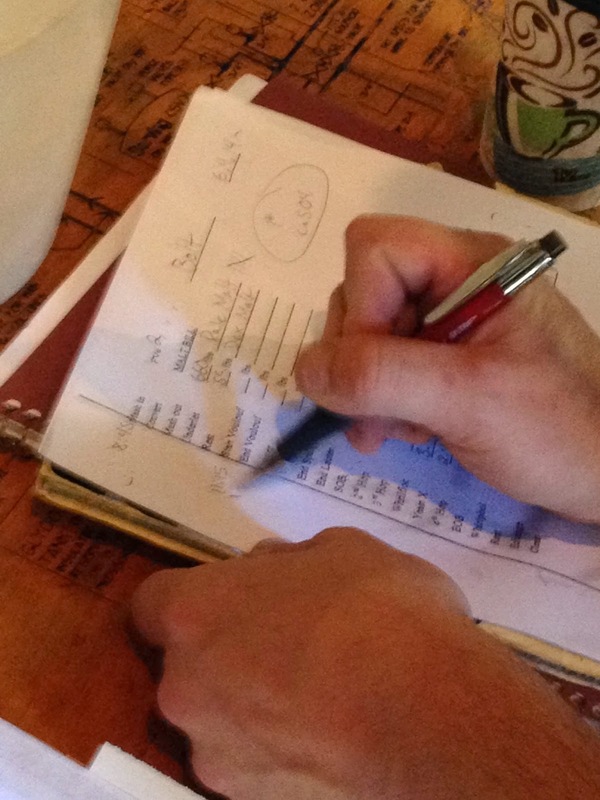 Dana keeps detailed notes on every batch he's ever brewed. Consistent quality is the key to staying in business and this whole craft beer phenomenon is after all, a business. 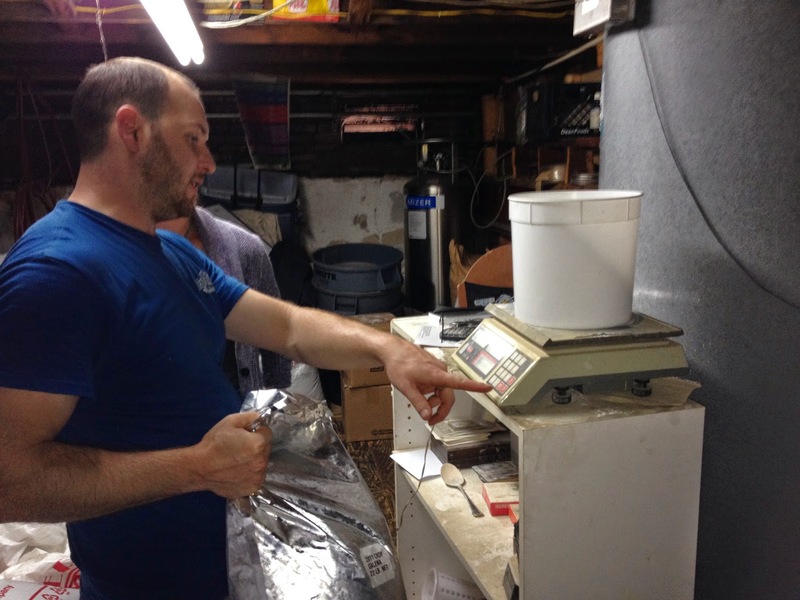 Among the many things that happened that day, I learned of another very important step in the brewing process, also involving a specialized tool. I was very fortunate that Dana was willing to delegate this critical task to me. I must have passed the test, cause he turned to me several times to perform this essential job! And now it's just a matter of waiting 4-5 weeks, then we can enjoy the "fruits" of our labor, a refreshing, crisp and dry pint of IPA deliciousness! Back in June, I spent the day at BR while Brewmaster Dana Dickinson and assistant Kat Kilpatrick brewed up a fresh batch of Bolt Cutter IPA on their 10bbl system.